I am back in China from Tibet. Back in Chengdu and on my way to Leshan straight from the airport. It is raining, wet and misty. Leshan, presiding over the confluence of two rivers which sweep past the foot of Lingyun hill, is a huge statement of faith and site of the world’s largest carved stone Buddha. Sculpted from the rock face, the effigy is a staggering 71 meters in height and is even more impressive for having been made over 1,200 years ago during the Tang dynasty. 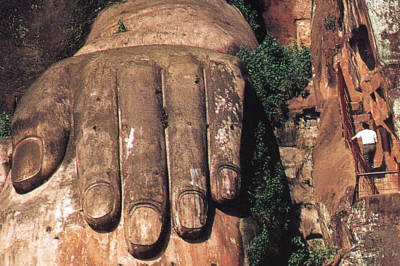 The Buddha’s head is 15 meters high; his ears come in at a lengthy 7.5 meters, and his sizeable feet can hold an audience of 100 people, while he looks down with his three meter wide eyes. The Buddha represented is the Maitreya Buddha, the Buddha of the Future. The outsized deity is a marvel to behold more for its scale rather than for any exquisite carving. Haitong, a devout monk from nearby Lingyun Temple made this his labour of love, starting in 713 AD, but died before its completion 90 years later. He embarked on the project so that Buddha’s presence would calm the turbulent waters of the Dadu and Min rivers below which had claimed many lives. An elaborate drainage system was built into it to prevent the worst effects of weathering. The statue was at one time covered with a protective wooden covering, but this was destroyed during the Ming dynasty. I took the boat and sailed right around the hill and up close to the statue, following it with going down roughly-hewn steps cut into the rock next to the statue, and then up again to the Great Buddha Temple above Buddha’s crown. No matter which direction I climbed the colossal red rock statue, covered randomly with moss and vegetation, looked magnificent against the grey drizzling sky. My earlier guide in Chengdu, Sue, had been thin, pretty, overtly sensitive, always trying too hard to please, too hard to explain. She had, at all times, somehow managed to look stricken with her shy quiet manner. My guide this time around, I forget her name, was the complete opposite. Short, squat, overconfident, talking nineteen to the dozen with me about everything under the sun including her love life or incessantly in Chinese with the driver, her passion in life was undeniably food. Her eyes would light up every time at the sheer mention of it. Mealtimes were more for her benefit than mine. 🙂 She would order all her favourites at the hotel restaurant and dig into them voraciously, while I pecked away too wrapped up in my day. Every adventure started with her “are you sure you really want to climb up, see, go, look, cross, walk, take the next turn; there is nothing much to see ahead,” and always ended with my firm excited “yes.” How would she know what the world looked like to a traveller’s hungry eyes. Guides, I learnt were not always shadowy insignificant creatures in the background that led us ahead. In China, in the remote backwaters, they were the leaders and we the temporary visitors, ignorant of all language, customs and ways, trailing passively behind with stars in our eyes. Emeishan, one of the four sacred Buddhist mountains of China originally teemed with Taoist hermits and recluses, but was appropriated by followers of Buddha in the 6th Century. The philosophical founder of Taoism, Laozi, is thought to have lived here in a mythical incarnation. The four Buddhist mountains are said to be protected by the Four Heavenly Kings of the four directions. Emeishan, the western-most, is the highest at 3,099 meters. The spirit of the deity Puxian, generally depicted riding an elephant or holding a lotus flower, is believed to infuse the temples, rocks and trees of Emeishan, enticing devotees up its gruelling height. Baoguo Monastery, at the base of the hill, was originally built by a Taoist and some Tao elements remain. Also known as Thanksgiving Temple it was later rebuilt in the Qing dynasty. The first emperor of the Qing dynasty ascended the throne at the age of four. Historical records claim that he died of illness at 28, but in fact he had became a monk. His son was aware of this and, consequently, spent a lot of time and money promoting Buddhism and the Thanksgiving Temple. Various other temples dot the slopes. Mt. Emei is known variously as sunrise, cloud sea, saint light [at night-time the lights light up the mountains], and Buddha light: one can see one’s own reflection in the air on a bright day following rain or snow. Both Leshan and Emeishan are visited mainly by locals or Japanese. Western foreigners are rare here. Indians an oddity. People would stop in their tracks and gaze at me like I was some creature from outer space. Strangers would rush and want to have pictures taken with me. When standing in a queue I would be surrounded and gawked at. It was a very bizarre feeling. I had been so long in China by now, surrounded by Chinese, I had forgotten I looked different. If perchance I caught myself in the mirror, I surprised myself the most. The figure staring across was truly alien. Even to my own eyes. I spent a whole day at Mt. Emei. Bundled into a minibus early in the morning followed by a cable car ride, I reached Waifu summit and its temple at 3,077 meters swathed completely in white clouds. A tangible silence and serenity permeates the peak. Incense smoke drifted through the temple and I, like others, kneeled and prayed. I felt like I was on a pilgrimage. Part of the way up was through steep wet steps cut into the mountain side passing hordes of indigenous red-faced monkeys gaping at us and our belongings. Stalls lined the way selling local herbs, teas and prayer bracelets made of every conceivable colour and material. After wandering to the extreme edge of the mountain to gaze blankly at a voidless sea of white cloud we drove down midway to have lunch at one of the dozens of eateries lining a square crowded with huge groups of visiting local families and friends. Lunch was corn with green chillies. With chopsticks. The hike through the inner mountains was undeniably the highlight of the day. It was magnificent and though it rained right through, there was something special about hiking through a rain-forest in the rain. Steep slopes encased in tall lissom verdure trees huddled around an animated river tumbling over silver-grey rocks and pebbles. Every now and then I would encounter a quaint pavilion, temple or bridge. I was hiking towards a reserve for the monkeys indigenous to the mountain area. Though I had passed them on the way to the summit, there were none now in sight. But the beauty of the climb more than made up for it. Most of the climb was up steps lining the mountain side, but now and then I would walk by the banks of the river or over rounded weathered boulders in the middle of the waters with misty green mountains engulfing me on all four sides. I was drenched by the end. My last stop was the Baoguo Temple, a walking distance away from my hotel which nestled at the foot of Emei. It was prayer time and the monks were busy chanting. An aged 93-year-old monk by the door gave me a sandal wood prayer bracelet. It was beautiful; I hope to always keep it with me. There was a mix up in my flights. Wrong dates on the tickets. My guide managed to get a flight for the same day, but could only manage a late afternoon one. I had hours to idle away at the airport. I had woken up at 5 to catch the plane. There is no better cure for disappointment than good food. I gorged myself with Pringles chips and soft butter cakes from Europe whilst young couples heavily pawed and petted each other, families munched away at chicken feet with glee, and middle-aged women peeled fruit and fed their messy looking husbands. I arrived in Kunming to be welcomed by my Americanized guide with the thickest American accent, Bermuda shorts and the loudest guffaws. He had never stepped out of the province in his whole life. Kunming or Spring City is the capital of Yunnan “South of the Clouds” province. Its name comes from a vanished minority group called the Kunmi. Because of the mix-up in my flights there wasn’t much I could see in the city. I arrived late in the evening; by then all official doors and gates to historic sights were closed. Early next morning we drove to the Stone Forest, China’s natural wonder. The limestone karst outcrop known as the Stone Forest bristles 120 kilometres south-east of Kunming. Covering an area of 360 sq. km, only 50 sq. km have been developed. The ashen stone pillars, abandoned by the sea as it receded 270 millions years ago, bunch together into a geological thicket. Their twisted and shattered form is the result of excessive weathering. Paths bore between the limestone pillars, past pools, pavilions and peaks. The journey to the forest is as beautiful as the landscape itself. Scattered around the stone forest are villages populated by the local ethnic minority, the Sani, one of the 21 branches of the Yi tribe. There are 55 different minorities in China of which the Yi have the largest population in the Yunnan province. 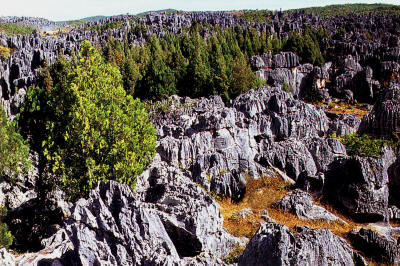 Though equally unpopulated by foreign tourists, the Stone Forest is an extraordinary experience. Hiking through millennia old sea-beds with actual fossils lining the grey towering rocks puts our whole planet on a difference perspective, drawing attention to the complex epic process of evolution and nature. There is so much to our world. On every level. A lifetime seems far too short a span to truly understand and love it. We just seem to get to skim the surface in our curtailed existence. This entry was posted in China, Exploring our World and tagged Chinese Minority Nationalities, Emeishan, Kunming Stone Forest, Leshan, Mt. Emei, Sacred Buddhist Mountains of China, Things to do in China by Rama Arya. Bookmark the permalink.